With studies suggesting that from 20% to as many as 40% of patients with anorexia nervosa (AN) also have body dysmorphic disorder (BDD), attaining competence in the assessment and treatment of this condition has to be high on the “to-do” list of every clinician treating a substantial number of eating disorder patients. Patients with AN are generally displeased with their overall weight and shape. In contrast, individuals with BDD are consumed by obsessional thoughts and shameful feelings stemming from beliefs that specific parts of their body– for example, their forehead, ears nose, chin, sternum, hands, or feet–are ugly and/or disfigured. Sufferers believe that other people notice these “defects” and ridicule or pity them accordingly. BDD patients often develop accompanying rituals and other maladaptive coping strategies to contend with and/or correct these perceived disfigurements, from social avoidance up to and including repeated (and often unsatisfying) cosmetic surgeries. The degrees to which individuals with BDD actually believe that their body parts are truly disfigured vary considerably. Some BDD patients remain more or less objective and realize that their obsessional beliefs aren’t actually true; their beliefs are “ego-dystonic.” At the other end of the spectrum, some individuals are delusional, unfailingly convinced that they are accurately perceiving (nonapparent) defects. These variations in degrees of insight vs. degrees of conviction about the perceived defects parallel the cognitive phenomena seen in both obsessive-compulsive disorder and AN, conditions that are “kissing cousins” to BDD, ranging from overvalued beliefs to delusional ideation. Evidence-based treatments for BDD include pharmacotherapies (SSRIs, in particular, have demonstrated efficacy) and CBT. A great deal of data delineating BDD and these effective treatment strategies has emerged from NIMH-funded research programs at Harvard, Brown, and Boston universities, home bases to the trio of distinguished authors who give us this exceptional volume. Clearly written, detailed and practical, this manual guides clinicians in a step-by-step fashion through the workup, differential diagnosis, treatment planning, case selection considerations, and treatment implementation for patients using a carefully minted strategy called CBT-BDD. 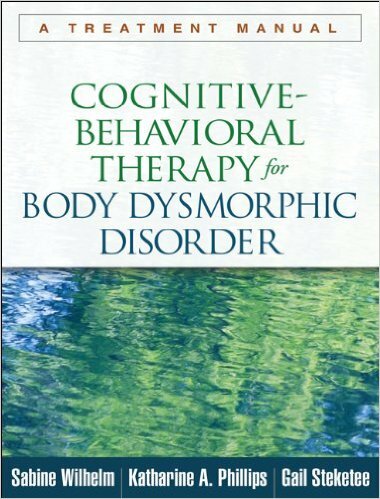 Chapters on special considerations in treating BDD patients, issues to think about before starting therapy, and techniques and strategy to enhance motivation precede the introductory sessions of the CBT-BDD itself. After thoroughly attending to assessment, case formulation, goal-setting, and various core treatment components for all patients, the sessions focus on evaluating thoughts, exposures, preventing rituals, perceptual retraining, and advanced cognitive strategies, before winding up with relapse prevention. Optional modules consider the special issues of skin picking and hair pulling (trichotillomania), weight, shape and muscularity (as might be encountered in patients with the “Adonis Complex”), cosmetic surgery, and the very common co-occurrence with major depression. Recommendations for allocating time and activity are offered for each session. Numerous worksheets, checklists, rating scales, handouts and other forms that might be used during treatment are included. Ample consideration and discussion addresses bumps in the therapeutic road, such as patients’ difficulties in engaging, doing the work, sustaining participation, therapeutic resistance and non-adherence. Verbatim examples of patient-clinician interaction are presented in most chapters to further illustrate blow-by-blow interactions clinicians are likely to encounter as each particular issue is faced. I haven’t seen a better CBT manual for BDD, and I’ll be enthusiastically recommending this volume to all trainees and practitioners who employ (or who hope to employ) CBT techniques to treat BDD.